Puck lights, which get their name from their hockey puck-like shape, are one of the most versatile light fixtures around. They fit almost anywhere and can function as under cabinet task lighting, display lighting, and even safety lighting. If you’re still in the dark about how many puck lights you need for your next lighting project, just follow these guidelines. First, determine what you’re going to use your puck lighting to illuminate. We recommend using 1 puck light for every 6-10 inches of cabinet or shelf space. If you’re lighting 11-18 inches of space, use 2-3 puck lights. For 19-26 inches, you’ll need 3-4 puck lights. For 27-34 inches, 4-5 puck lights. For 35-42 inches, 5-7 puck lights. For 43-50 inches, 6-8 puck lights, and so on. Just measure your space and divide it up accordingly! This will ensure that the light levels are consistent for the entire length of your shelf or cabinet, without causing awkward shadows. Here’s where the puck light’s versatility really comes in handy. If you’d like to use them to showcase favorite items on shelves, in curio cabinets, or even over your fireplace, you should place a puck light directly above each item. Base the number of puck lights you purchase on how many items you wish to display. Here’s a tip from the experts: Since puck lights are so small, you can first test how many you’ll need by temporarily taping them to the bottom of your shelves or cabinets. If the illumination is still not enough, you can add more puck lights without the hassle of uninstalling and/or repositioning every other light on the surface. To learn more, check out the puck lighting page on our website. What are your questions about puck lighting? 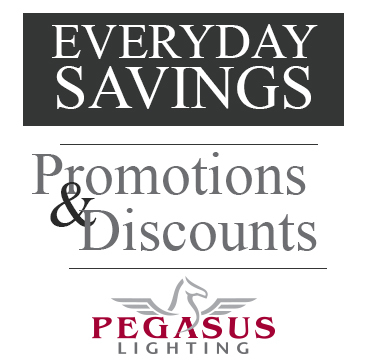 We’re here to help you with your next lighting project!